This entry was posted on September 1, 2016 by Zoe Thomas. 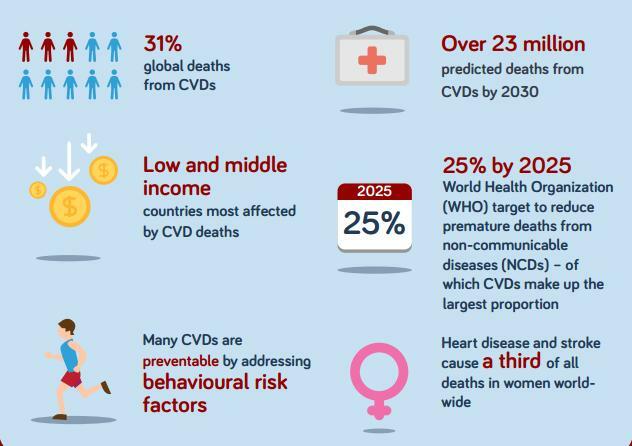 World Heart Day will take place on Thursday 29 September in a bid to raise awareness of the world's most common cause of death: cardiovascular disease (CVD). To help support this initiative and continue our own campaign to get defibrillators out into communities and workplaces, we're offering over 45% off our LifePak CR Plus (including a training unit). This year the World Heart Federation (the organisation behind the awareness day) is encouraging people to take little steps to improve the health of their hearts, such as cutting down on alcohol, stopping smoking, eating more healthily and doing more exercise. The infographic also reveals that the economic burden of CVDs on the UK is £15 billion a year. As an employer, you can make a difference. The policies you put in place now could prevent your staff from suffering from strokes, heart disease and heart attacks in the future. Doing so can only help your business by reducing sick leave, boosting productivity and fostering a happy, caring and health-conscious office culture. Give out pedometers - these low-cost devices can be clipped to clothing to monitor the number of steps taken in a day. The optimum number is 10,000 for most people, but why not set reasonable goals for your employees and introduce a little healthy competition to see who can rack up the most steps? Walking briskly can lower your risk of high blood pressure, high cholesterol and diabetes - and some studies show it's just as effective as running. Gym membership - Offer free or discounted gym membership, or why not invite a personal trainer to give classes at lunchtime or after working hours? Healthy food options - Get rid of any vending machines selling fatty or sugary snacks. It's these high calorie nibbles that can cause weight gain and lead to heart disease. Instead, offer fruit, nuts and other healthy snacks. Invest in sit-stand desks - Prolonged sitting is thought to contribute significantly to heart disease, diabetes, obesity and even some cancers. Reduce your employees' sitting time by investing in sit-stand desks as part of an active working culture. > You can browse our range of sit-stand desks here. These are just some of the ideas you could trial to encourage healthier lifestyles at work and help stave off the many serious, life-threatening diseases that can be exacerbated by office work. If you're interested in getting involved with World Heart Day on 29 September then take part in the Healthy Heart Selfie campaign and tag #WorldHeartDay and #Posturite so we can see what you're up to.